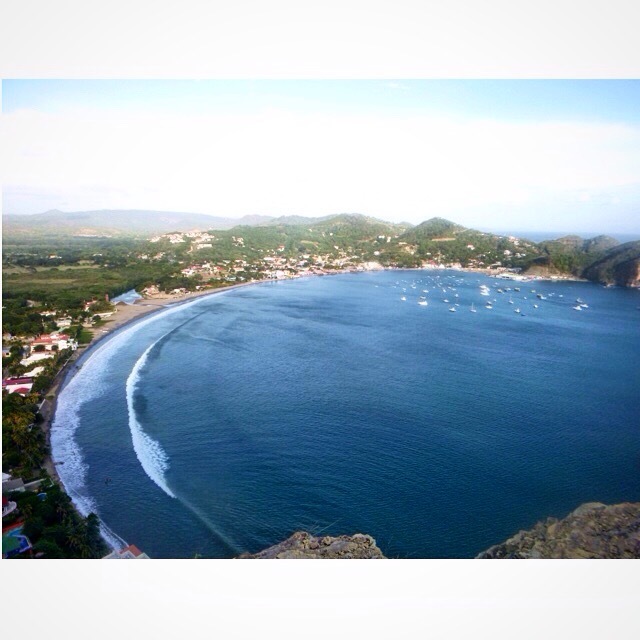 Our first stop in Nicaragua was the much talked about town called San Juan Del Sur. The border crossing into Nicaragua was by far the strangest one I have ever seen. After two really hot and sweaty public busses, we exited Costa Rica, and walked for what felt like ages in the sweltering heat with all our luggage to the Nicaraguan border. Once we got to the border, it really wasn’t clear where to go. There were people checking our passports, people telling us to pay 1 dollar here, 5 dollars there, local people who looked like they didn’t work there were directing us where to go. At one point we were led to a man in a little tin shelter who handed us a little piece of paper with a stamp on it. I thought I was going to have to glue in my own passport stamp, it was all very strange. After all the weirdness, fees and the copious amounts of sweat, we were in a taxi on the way to San Juan Del Sur. SJDS, was once a little fishing town (it still is) and is now a cool little beach town filled with delicious restaurants run by locals and expats, bars, awesome surrounding beaches for surfing and swimming, a crazy night life and enough tourism to make it fun with still enough of a local feel to it to be able to have an authentic Nicaraguan experience. 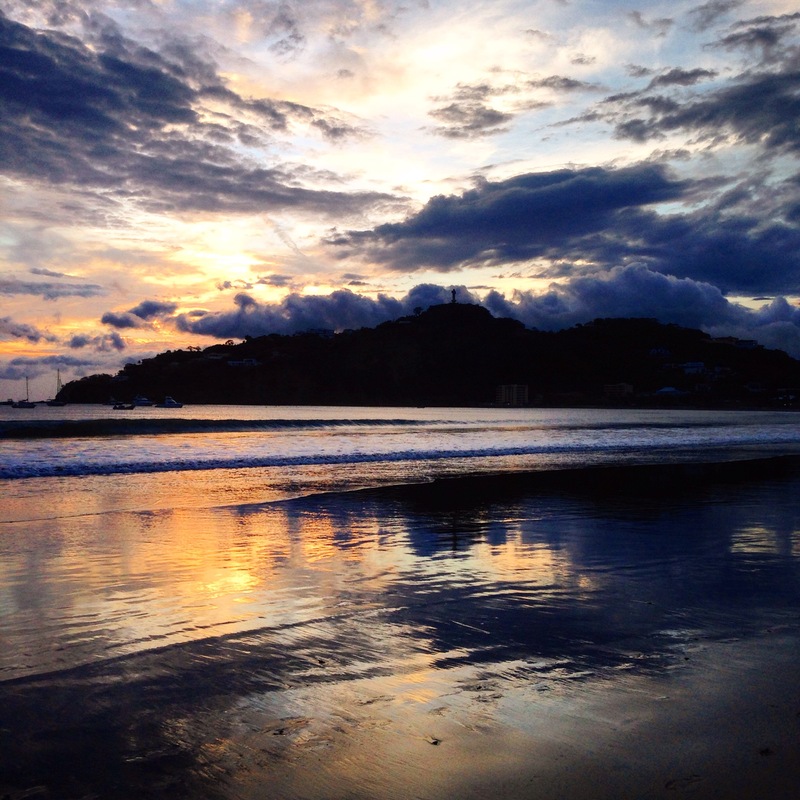 Rumour has it, its on it way to be a huge tourist destination like Tamarindo in Costa Rica in the next 5-10 years so if this is true, I suggest you go there now before it is ruined by tourism! Initially, we booked to say here for three nights but we ended up staying 10 (don’t you just love the freedom of backpacking?!) We fell completely in love with the scenery, the people, the chilled vibe and amazing food instantly. Here is my guide to SJDS.. This is where we spent all our nights. It’s the perfect hostel if you like a good atmosphere but also want to get some sleep. There is a pool, a bar an amazing roof top terrace, yoga and super friendly staff. This hostel is located one street back from the beach. They have shuttles to the surrounding beaches every day, a pool, a party atmosphere and you get Sunday funday half price when you stay there. 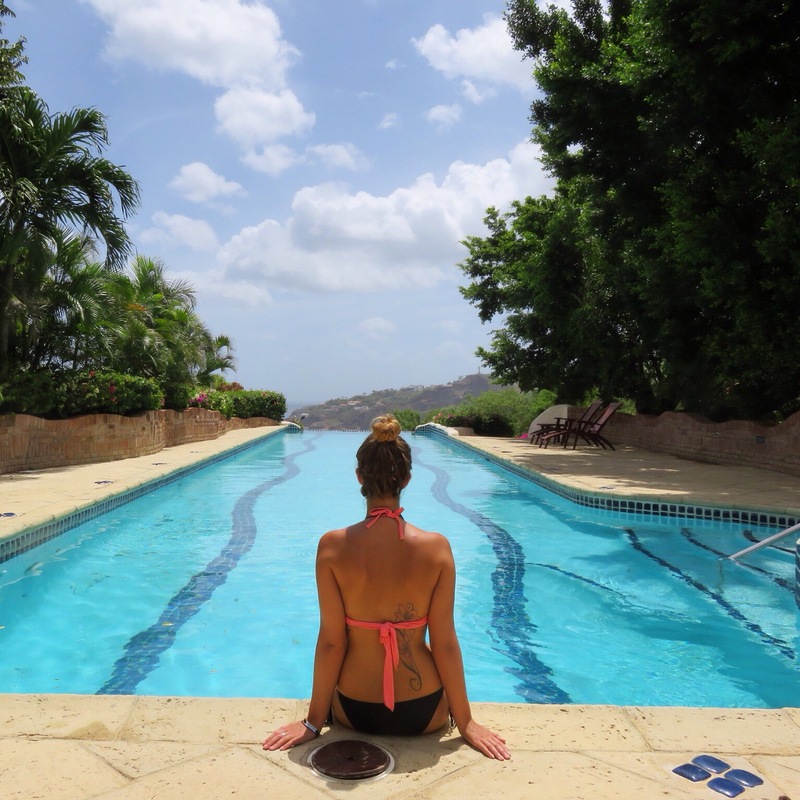 An extremely popular party hostel with an amazing pool and view from its mountain location. It’s located 10 mins out of town but has a free shuttle every hour. This hostel is run by a local family and it has a homestay type feel to it. It is clean, has cheap dorms, is right in town and has friendly staff. No party atmosphere here, so if you like sleep, this is for you. Where do I begin?! 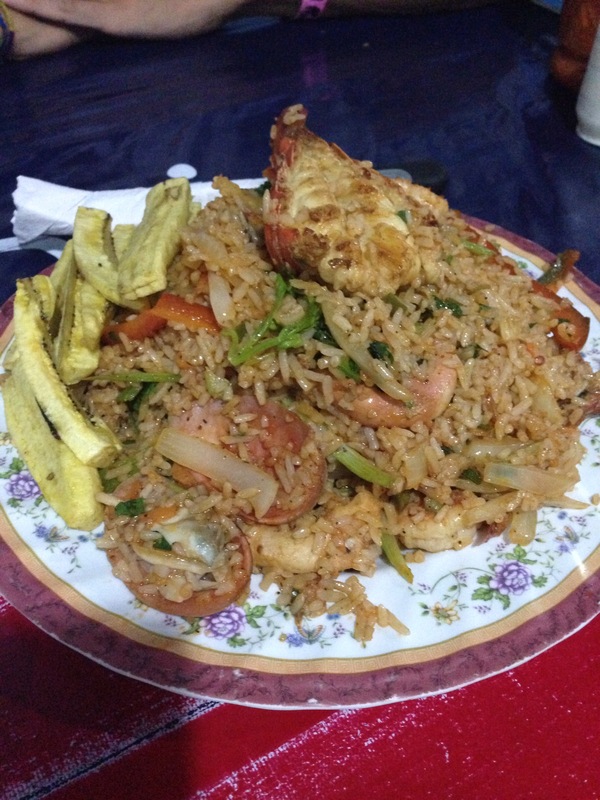 We ate some of the best food of our whole trip in SJDS and it is also really affordable. Our wallets liked it much better here than Costa Rica. Taco stop. (Not to be confused with Taco Spot which is around the corner. Weird, I know). This place has delicious tacos, burritos and quesadillas for super cheap. I ate enough vegetarian burritos here to last me a life time. Who am I kidding!? How good are bean burritos with guacamole?! This place looks a little rustic from the outside but we all know the saying “don’t judge a book by it’s front cover” You’ll be glad you didn’t when you try their amazing, fresh seafood dishes. Did I mention it’s also cheap? We ordered the delicious seafood rice and it was big enough for two. All for just $12AUD Lobster and all. It’s located right on the beach and boasts a really good $1 food and drink happy hour menu, from Tuesday to Friday 4pm-6pm. It is the perfect place to go an have a few drinks, a snack and watch the beautiful sunsets at the beach. This restaurant is famous for its 90 Cordoba menu ($4.50AUD). I wouldn’t say the foods is amazing but it’s great value for money with it’s big portions. 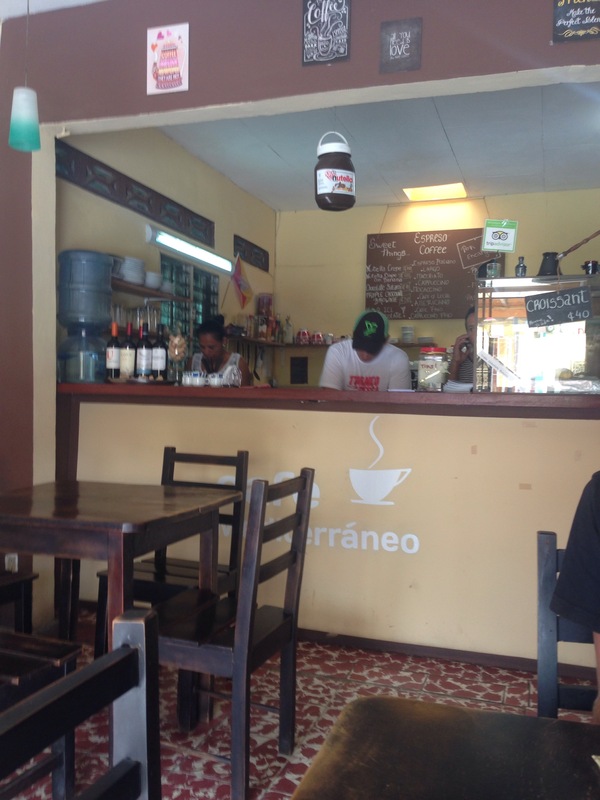 This cute little Italian owned and run cafe has some of the best coffee we have had in all of Central America. It has big, cheap breakfasts and fresh made croissants everyday with Nutella. If you like donuts then this place if for you! It’s owned by an American and fresh donuts are made every single day so there is no chance of getting a stale one. We went there more than we should have but they were just so good! Every day there is two feature donuts. My favourites were the salted caramel and the Mexican chocolate which had an unexpected spicy kick to it. There is plenty to do in SJDS to keep you occupied. Hike to the Jesus statue. A walk along the beach to the right followed by a rather steep road will get you up the mountain to Jesus in 45 minutes. You pay $2USD at the top to enter. You get a view of the whole bay of SJDS and it is simply breathtaking. It is definitely a ‘must do’ in my opinion. Go surfing or swimming at the surrounding beaches. You can get a shuttle from some of the hostels around town and most of the surf shops for around $5-$10 depending on which beach you want to go to. Our favourite place to get a shuttle from was O’shop, run by an awesome French guy who took us wherever we wanted and when we wanted so there was no waiting around for the shuttle to be filled with people before leaving like most other places. We visited Playa Maderas, Playa Hermosa, Playa Remanso, Playa Yankee and Playa Marsella. According to my boyfriend (the surfer out of us two) he said he got the best waves at Playa Maderas and Playa Yankee. 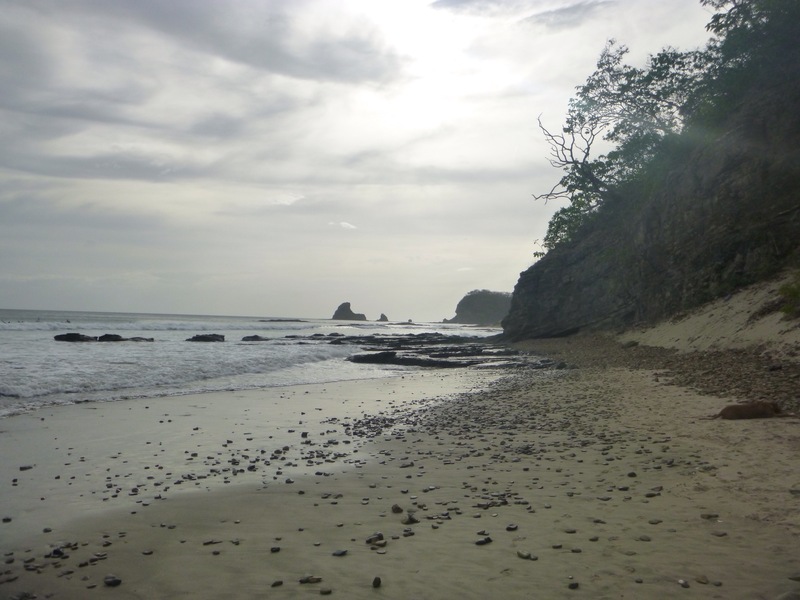 Playa Hermosa was my favourite beach to visit. It has a long sandy stretch perfect for romantic (haha) walks along the beach. We saw rock pools filled with lobster, crabs and fish when the tide was out. It was beautiful. Feel fancy at Pelican eyes. Pelican eyes is a big resort (the only one in town as far as I saw) which has a restaurant and three infinity pools to chose from. It is located on the side of the mountain so the views of the town and bay are unreal. They have a deal where you pay $15USD and you get 4 beers, nachos, chicken wings and free access to the pools…or if you are naughty like us you can try sneak in, act like you’re a guest and swim in the pools for free! The sunsets in SJDS are simply breathtaking. There are plenty of restaurants along the beach to watch it from or you can just watch it the old fashioned way, sitting in the sand. Even after 10 days here, I still felt like I wasn’t ready to leave but alas, the rest of Nicaragua and El Salavdor were waiting for us. I know plenty of people who come here solely to party at their hostels and participate in Sunday funday, which is fine if that’s what you like but there is so much MORE to SJDS that can be discovered without a drink in your hand or a bad hangover. This town has definitely been a highlight for me so far on this trip. 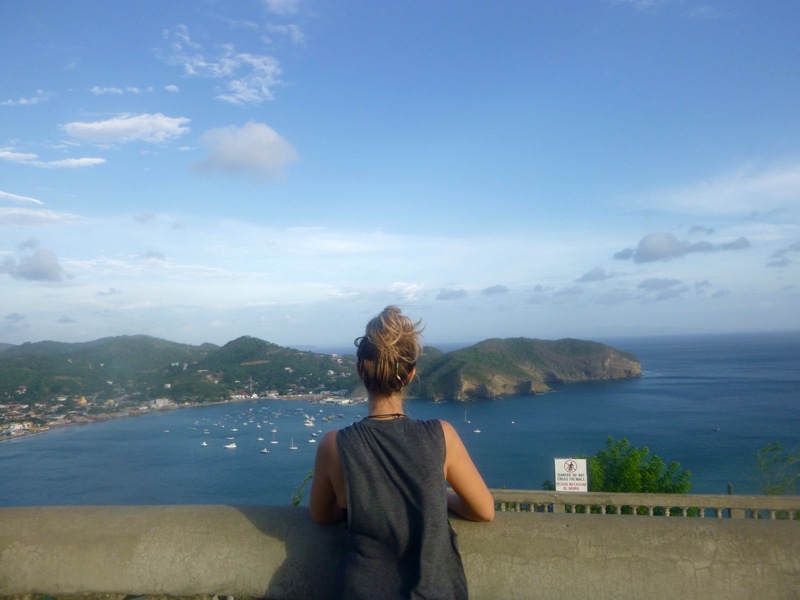 I hope this guide helps you to get the most out of your San Juan Del Sur experience should you ever go there. I am day dreaming about going back already!